ኣብ ናይ ሎሚ ክፋል፡ ኣብ ለንዶን ዝቅመጥ ካብ 2% ኣብ መባእታ ካብ ዝምሃሩ ትሕቲ 5 ዓመት ዝዕሚኦም ደቂ ተባዕትዮ ዝምህር መምህር ከኸውን ኢዩ። እዚ ኣብ መላእ ዓለም ብዘለው ናይ መባእታ መምሃራን ክንሓስብ ገይርና። ናይ ሎሚ ሕቶና ካብ The Organisation for Co-operation and Development ዝተወስደት ኮይና፡ ኣበየነይቲ ሃገር እዩ ናይ መባእታ መማሃራን ደቂ ተባዓትዮ ልዕሊ 50% ዝበጽሑ? You would never ‘consider it’ ኣብ ግምት ምእታው ማለት’ዩ።? ‘To tap into something’ ናይ ሰብ ባህሪ ምርዳእን ምግላጽን እዩ። Yes, I’ve seen you tap into those sides of your personality here in the studio sometimes, Phil. Maybe some people don’t respect primary school teachers because the ‘perception’ ኣረኣእያ is they spend all day playing with children? ርእቶኹም ኣብዚ ኣርእስቲ እንታያ እዩ? ኣብያተ ትምህርቲ ‘draw more men to teaching’ ናብ መባእታ ክስሕባ ኣለወንዶ? እንታይ እዩ ንደቂ ተባዓትዮ ‘put men off’ ንኸይጽንበሩ ዝገትኦም ዘሎ? My brother came back from the cinema and told me terrible things about the film he saw. It was really trying to _____ _____ _____ seeing it. 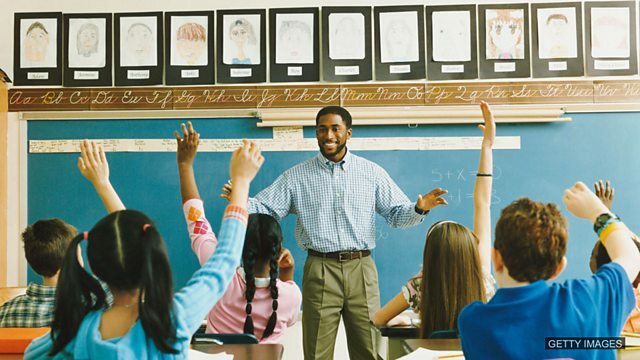 Do you think schools should try to draw more men to teaching at primary level? What are some of the things that put men off from joining the profession in your country? Tell us on our Facebook group!